The brook trout actually a char and not a trout at all live in small streams, creeks, lakes, and spring ponds with some being anadromous. The brook trout is native to a the eastern North America. 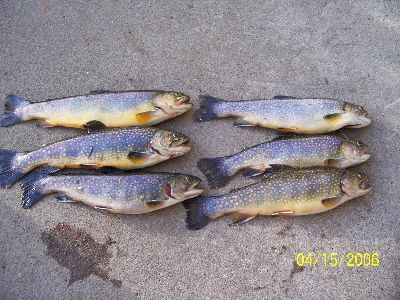 Brook trout as would be expected are limited in their range to cool waters and are absent from the Southeasten States except for the few mountainous areas. They have also been introduced to waters outside of their native range. The brook trout is of dark green to brown in color with a distinctive wormlike patterns on the back and spots on the sides. Brook trout have distinctive red dots, surrounded by blue haloes, along the flank. The belly and lower fins are reddish in color, the leading edge of the lower fins and lower jaw are white. Twenty-one lbs is the maximum weight but anything larger than a pound would be considered a large specimen. Where the fish lives often limits the size of the trout.